MoALF. 2016. 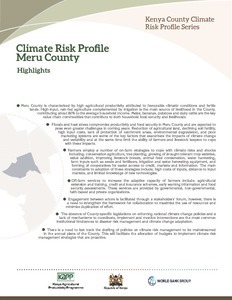 Climate Risk Profile for Meru. Kenya County Climate Risk Profile Series. The International Center for Tropical Agriculture (CIAT) and the Kenya Ministry of Agriculture, Livestock and Fisheries (MoALF), Nairobi, Kenya.